Welcome to the Fit Small Business Xero training course! In this lesson, we’re going to cover how to create a credit note in Xero. Why Is It Important to Create Credit Notes? A credit note can be used to reduce the amount that a customer owes you (accounts receivable balance) or the amount that you owe to a supplier (accounts payable balance). You issued an invoice to a customer and the customer noticed a mistake before making the payment. 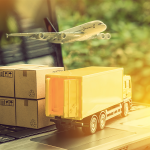 You issued an invoice and received payment from a customer; later on the customer returned some or all of the products that were purchased and paid for. You issued an invoice and then later decided to apply a discount to the invoice. You issued an invoice and the customer has overpaid you. Read more about these scenarios here and read on to learn how to issue a credit note. Add a credit note directly to an existing invoice or bill – Go with this option if you know which invoice (or bill) you want to allocate the credit note to. Add a credit note to a customer or supplier – Select this option if you want to just put a credit on your customer(supplier’s) account to be used at a later date. Copy an existing credit note – If you previously created a credit note for similar items, you can simply copy the existing credit note which will save you a few minutes of data entry. We will cover each of these next. Follow the steps below to add a credit note directly to an existing invoice or bill. 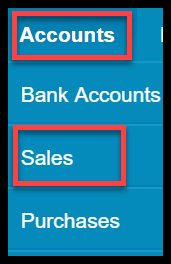 Step A – Navigate to Accounts and Sales (select Purchases for a Bill) as indicated in the screenshot below. 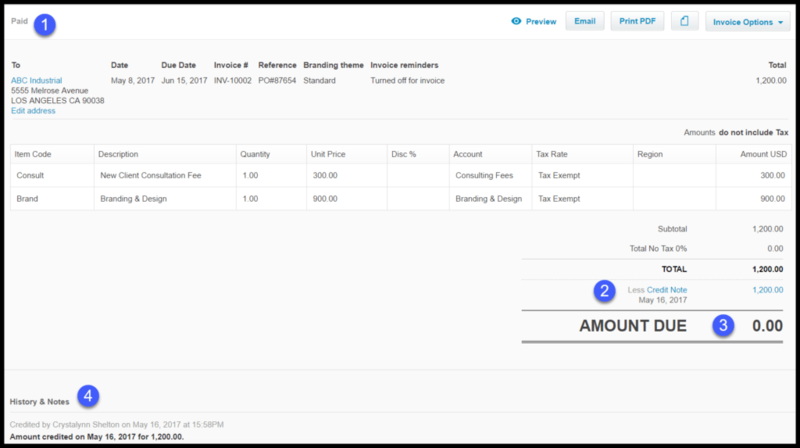 Step B – As indicated in the screenshot below, click on the Awaiting Payments option to locate an invoice that has not been paid. Navigate to Invoices Awaiting Payment in Xero. Step C – A list of unpaid customer invoices will display. Click anywhere on the invoice row to select an invoice as indicated in the screenshot below. Step D – The invoice details will display. In the upper right hand corner, click the “Invoice Options” button and select “Add Credit Note” as indicated in the screenshot below. Step E – The New Credit Note is displayed in the next screen. A snapshot along with a brief explanation of the fields of info below. Create a New Credit Note in Xero. To save you some time, Xero has copied all of the information that appeared on the customer’s invoice to the credit note. If you plan to issue a credit for the entire invoice and you don’t want to make any changes just Save or Approve the credit note. However, if you only want to issue partial credit then make the changes to reflect the products/services that you would like to issue credit for. Credit Note # – This is a unique number issued by Xero to keep track of all credit notes issued. In the how to set up invoices lesson, we discussed how the numbering sequence works. Note: I recommend that you do not make any changes to this number to avoid using a duplicate number. Less Credit to Invoice INV-XXXXX – This field reflects the invoice that the credit note will be applied to. Save as draft – This option will save your credit note and allow you to close out of this screen. Save (continue editing) – This option will allow you to save your credit note before you are done with it. You can save periodically so that you don’t lose any information. Save & add another – This option will save your credit note as a draft and open up a new credit note for you to complete. Approve – Depending on your user permissions, you may be able to approve credit notes. If not, then you will select the save and submit for approval option. Step F – The updated invoice is displayed on the next screen. Invoice Balance after Credit Note has been added in Xero. Paid status – The status of the invoice has changed from awaiting payment to paid. Credit note Info – The date and amount of the credit note that was applied is indicated here. Amount Due – Xero calculates the difference between the Total Invoice amount less the credit note. In this example, the amount due is now 0.00 since our credit note was for the entire invoice. History & Notes – In this section, you will see who created the credit note along with the day and time it was created and the amount. Follow the steps below to add a credit note to a customer. Step A – Return to Sales and click the “+New” button to select Credit Note as indicated in the screenshot below. Add a Credit Note to a Customer or Supplier Contact in Xero. Step B – Enter info into the fields to complete the credit note as indicated in the screenshot below. Complete the fields of a New Credit Note in Xero. Since we did not create this credit note for a specific invoice(or bill), Xero does not know which customer (or supplier) the credit note is for; therefore we must complete all of the necessary fields. To: From the dropdown, select the customer or supplier contact you want to issue the credit note to. Date: Enter the date of the credit note. Credit Note #: As mentioned previously, this number is issued by Xero and should not be changed. Reference: This field is optional and can be used to provide additional information about this credit. Branding: The branding theme that you selected during the invoice setup will automatically populate in this field. Click the dropdown to change it. Item: From the dropdown, select the item that you are issuing a credit for. Description: This field will auto-populate based on the item selected above. However, you can modify the description to include an explanation of why you are issuing the credit or any other pertinent info. Qty: Enter the quantity for each item. For services, enter a quantity of 1. Unit Price: This field will auto-populate based on the unit price set up for the item. If you need to credit a different amount, you can enter it in this field. Account: From the dropdown, select the account that you would like to use to track this credit. Generally you should select the same account that you coded the original product/service to. Watch our how to set up accounts tutorial to learn more about the chart of accounts. Tax Rate: This should default to the sales tax rate that you have set up. However, if you did not charge sales tax or it differs from the default, select the correct sales tax rate from the dropdown. Region: Xero allows you to set up tracking categories to see how different areas of your business are performing (i.e. departments, locations or regions). From the dropdown menu, you can assign a default tracking category to a credit; in the screenshot above region has been set up as a tracking category. Step C – Once you have saved the credit note, it will appear in the Awaiting Payments section of Sales as indicated in the screenshot below. Credit Notes will appear in Awaiting Payments in Xero until they are applied. Follow the steps below to copy an existing credit note. Step A – Return to Sales and click the status of the credit note that you want to copy; draft, awaiting approval or awaiting payment as indicated in the screenshot below. Step B – Click anywhere in the row of the credit note you want to copy as indicated below. Step C – The credit note will display. In the upper right corner click on the “Credit Note Options” button and select “Copy” as indicated below. Steps to Copy an existing Credit Note in Xero. Step D – The new credit note will display. You can make any necessary modifications (if any) or just save/approve it as indicated below. You can easily allocate, edit, void or delete a credit note by following the steps outlined below. Step A – Return to Sales and select the status of the credit note as indicated below. Step B – Click anywhere in the row of the credit note you want to select as indicated below. Step C – The credit note will display. In the upper right corner click on the “Credit Note Options” button as indicated below. How to Allocate, Void & Edit Credit Notes in Xero. Void – You will need to void a credit note that is either awaiting payment or paid. However, if a credit note is in a draft or awaiting approval status you can delete it. Note: The delete option will appear here in this dropdown for credit notes that can be deleted. Edit – Select the edit button to make any necessary changes that you would like to make to the credit note. That wraps up the section on how to create a credit note in Xero. The next lesson in our Xero Training Course will be how to receive payment from a customer. In this lesson, we will walk you through how to enter payments received from customers. To access this lesson or any of the others in the series, click here. For a free 30-day trial of Xero, click the link below.